That's a great group buy ! I had my eyes on Ranga pens for a while ! Edited by agarwaen, 30 May 2018 - 12:22. Thank you for the wonderful shots. The matte ebonite material indeed looks very pretty. What ebonite rod is this -- S1 matte or P4 matte? Form submitted for S20 clipless and Jowo fine nib. Edited by AlexS, 01 June 2018 - 16:11. Thank you for the opportunity to add the 8B to my collection! Edited by sandburger, 01 June 2018 - 15:46. I think they're similar to the Ambitious nibs that came on many Asa pens. Asa has Kanwrite nibs on some of their recent pens also, IIRC. I have a few Indian pens bought recently that came with Kanwrite nibs. 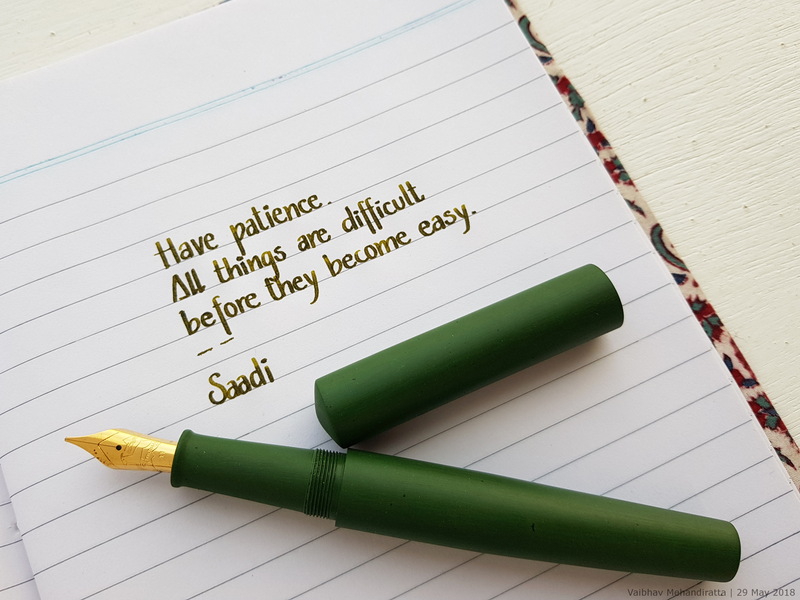 Including one Kanwrite pen from Fountainpenrevolution. They are very nice nibs. any idea once I choose a Kanwrite nib if I can also swap it with other nibs I may have spare (Jowo, Bock)? Is Kanwrite a size 6 nib? Is the thickness of the metal similar to Jowo or Bock, or would I have problems? I am aware it would be friction fit, but feel confident enough to swap it by myself if the difference between nibs is not an impediment. Edited by sansenri, 02 June 2018 - 17:15. I have not tried any of the swaps you mention, but to my eye the Kanwrite does seem like a nr 6 nib. I'd expect it to fit, with maybe a little fiddling - push further in, or pull further out, of the section as needed. If the feed is (slightly) too fat, taking off a little of its material with fine sandpaper has worked for me in the past. Thanks for the group buy on your great pens! Thanks to @Jamerelbe for redirecting me to the correct page, from the other page. If I purchase the eyedropper version does that mean that the ink will sit in the ebonite body of the pen? Will the ink damage the Ebonite body over time? And what would be the recommended steps for cleaning and maintenance (are ink flush solution/alcohol safe to use)? Also, any type of ink I should avoid using in this version? "Yowo or Bock nibs hmmmm...."
I have been using several ebonite ED fillers and I have not had any problems with them in that respect. After a good wash with water the barrel stops releasing ink and you can change ink colour, I have not had any problems of colour mixing or contamination after new ink is in the pen. I would not use any other cleaning agent on ebonite, even water does tend discolour ebonite slightly (especially bakul) so do not leave the pen immersed in water. The time needed to wash it however will not harm it . Wash it and leave to dry. I'm going to try the Kanwrite because I'm curious to try their flex nib. I have a few other Rangas ED with Bock nibs, so I know they will fit in general, I'm just curious to know whether when Ranga sets the Bock or Kanwrite nibs they have to modify the feeder between the two. I read some good things about the Kanwrite, in any case. I think you won't be disappointed Sanserni; the Kanwrite nibs are very nice. I don't have a flex, just some standard F nibs, one of which I've polished a little to become an F-sized stub, to give me a little line thickness variation; but I find them very similar to Ambitious and those I do have some flexes, they work well. 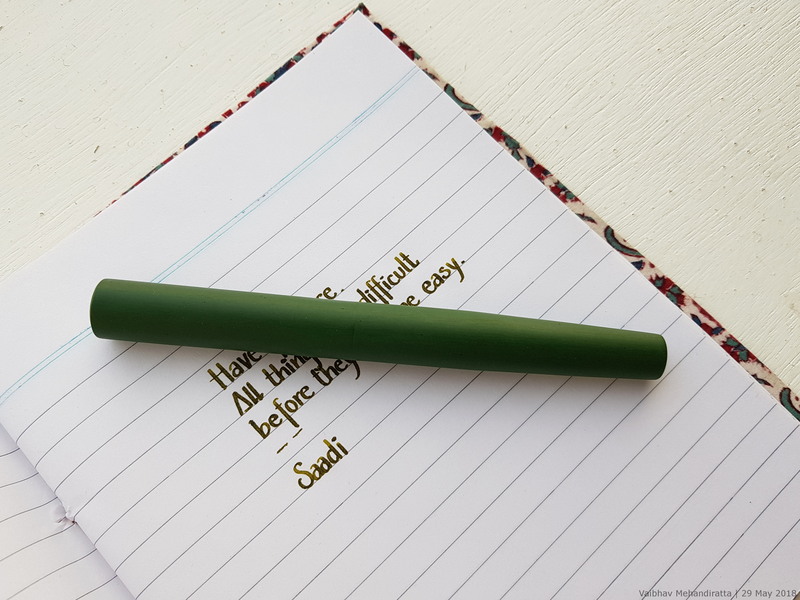 @SomoHapiens the main thing to realise with an eyedropper pen is that it comes with an ebonite feed and a limited range of nib choices (though you can substitute in your #6 nib of choice). Some people prefer this option because the pens tend to be super wet, with a massive ink capacity. Ink staining *could* be an issue, but who looks inside the pen in between fills? 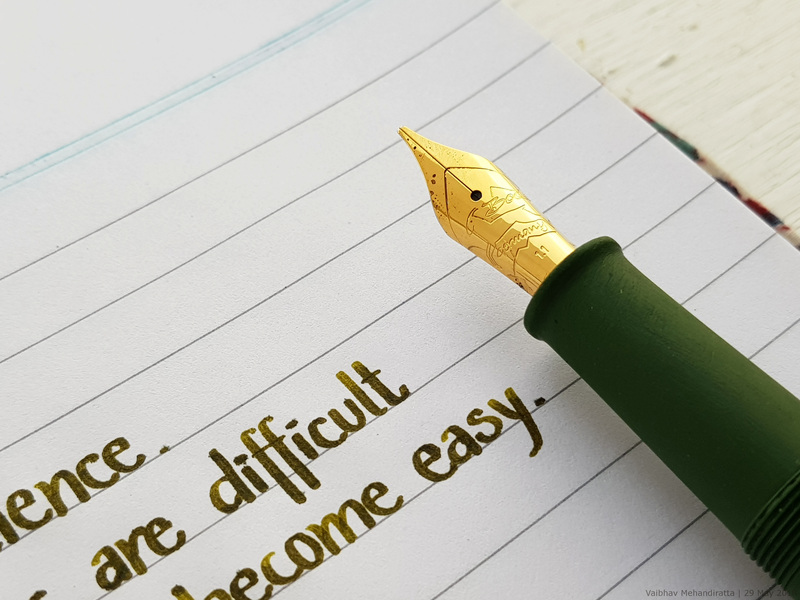 My main reasons for going with a JoWo or Bock nib assembly are related to ink capacity and flow: in my experience the plastic feeds are less gushy, and seem to be less prone to burping (you *can* use these pens as eyedroppers too!). An eyedropper pen with ebonite feed needs to be kept at least half full, or the air in the barrel will heat up as you hold it and force air out onto your paper! 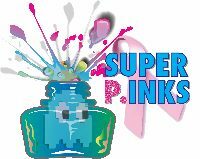 Personally, I prefer to use a cartridge converter - I like to change inks fairly often - but that's a matter of personal preference. The other advantage of JoWo or Bock nibs is that you can easily source replacements - I often just buy the pen body from Ranga, and but a custom ground nib assembly from fpnibs.com.